I've spent the past couple days putting together unit tests for SSIS packages. It's not as easy to do as it is to write unit & integration tests for, say, typical C# projects. SSIS Data flows can be really complex. Worse, you really can't execute portions of a single data flow separately and get meaninful results. Further, one of the key features of SSIS is the fact that the built-in data flow toolbox items can be equated to framework functionality. There's not so much value in unit testing the framework. There are a certain number of things you have to do before you can start writing C# to test your scripts and data flows, though. I'll go through my experience with it, so far. Interestingly, while you can develop and debug SSIS in the Business Intelligence Development System (BIDS, a subset of Visual Studio), you cannot execute SSIS packages from C# without SQL Server 2005 Developer or Enterprise edition installed ("go Microsoft!"). Another important caveat... you CAN have your unit test project in the same solution as your SSIS project. Due to over-excessive design time validation of SSIS packages, you can't effectively execute the SSIS packages from your unit test code if you have the SSIS project loaded at the same time. I've found that the only way I can safely run my unit tests is to "Unload Project" on the SSIS project before attempting to execute the unit test host app. Even then, Visual Studio occassionally holds locks on files that force me to close and re-open Visual Studio in order to release them. Anyway, I chose to use a console application as the host app. There's some info out there on the 'net about how to configure a .config file borrowing from dtexec.exe.config, the SSIS command line utility, but I didn't see anything special in there that I had to include. What I ended up doing was creating a very small framework that allowed me to declare a test and some metadata about it. The metadata associates a group of resources that include a test input, and the three baseline outputs by a common URN. Once I have my input and baselines established, I can circumvent downloading the "real" source file, inject my test source into the process, and compare the results with my baselines. I highly recommend you implement this interface and pass it into your packages. Of course, in each event handler in the interface, implement code to send reasonable information to an output stream. Notice the call to thePackage.Execute, way up in the first code snippet... the class that contains that method implements that interface, so I can manipulate (when necessary) how to handle certain events. Interestingly, I haven't needed to do anything fancy with that so far, but I can imagine that functionality being very important in future unit tests that I write. 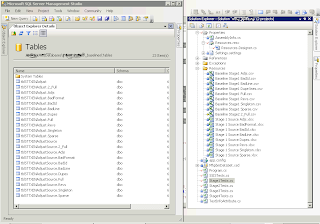 Here's a visual on all the resources... the image shows SSMS over VS, with both database tables and project resources with common URNs to relate them. I won't get into the details of the framework functionality, but I found it useful to be able to do things like set a flag to rebuild baseline resources from current outputs, and such. Another interesting lesson learned: I can see that the folks who built SSIS were not avid unit testers themselves. SSIS Executables have a "Validate()" method. I encountered lots of problems when I tried to use it. Hangs, intermittent errors, all that stuff that testing should have ironed out. Can you provide source code for this? I'll build a skeleton that includes the main points soon. Nice and very helpful Blog for SSIS unit testing. I am planning to do SSIS unit testing and it seems like your framework might be helpful. Is it possible for you to provide your framework?